UKM Second-year undergraduates experiencing a public transport ride with children from the Community-Based Rehabilitation Centre, Taman Ehsan Kepong. IN the Unesco 2030 Agenda for Sustainable Development unveiled in 2015, it was specifically emphasised that no one is “to be left behind” in the effort to achieve development for all. Included in the 17 Sustainable Development Goals (SDGs) is a focus on guaranteeing equal and accessible education to persons with disabilities by building learning environments and providing assistance. United Nations estimates 15 per cent of the world’s population live with a disability. Current figures from the Social Welfare Department show the number of registered persons with special needs in Malaysia at 464,672, probably a fraction of the real figure. While there is no breakdown of the number of children belonging to the school-going age in the registered, access to and availability of education catering to their special needs may still elude many, and many remain excluded from the mainstream community. Professor Datuk Dr Norazah Mohd Nordin, dean of the Faculty of Education at Universiti Kebangsaan Malaysia (UKM), said that parents of students with different abilities want their special needs children to given appropriate education and be included as rightful individuals in society — be they physically disabled, visual- or hearing-impaired, or have learning difficulties. Third-year undergraduates organising the Lensa Anak Istimewa programme at UKM. “Parents now are more open and they want places and opportunities where they can bring their children to learn and be a part of society. There are instances where parents send their special needs child to a school 27km away from home just so the child can receive the right education. Yet there is a school nearby with empty classrooms that can be utilised for special education classes,” she added. In view of this, the faculty has redesigned its special education programmes — from the bachelor’s and master’s to doctoral — to be more inclusive in nature in line with the SDGs. Under the Bachelors of Education with Honours (Special Education) course, for example, the aim is to nurture special educators who are skilful, knowledgeable and possess the aptitude for education and rehabilitation according to different settings as well as those who can advocate for students with special needs and are knowledgeable on current issues, trends and practices, and research into special needs education. “We work very closely with communities and also look into internationalisation. We recently signed a Memorandum of Understanding with Daegu University in South Korea, which strength is in special education, and will be sending our students for training there under a mobility programme so they can gain the latest knowledge in working with the disabled communities in the country. 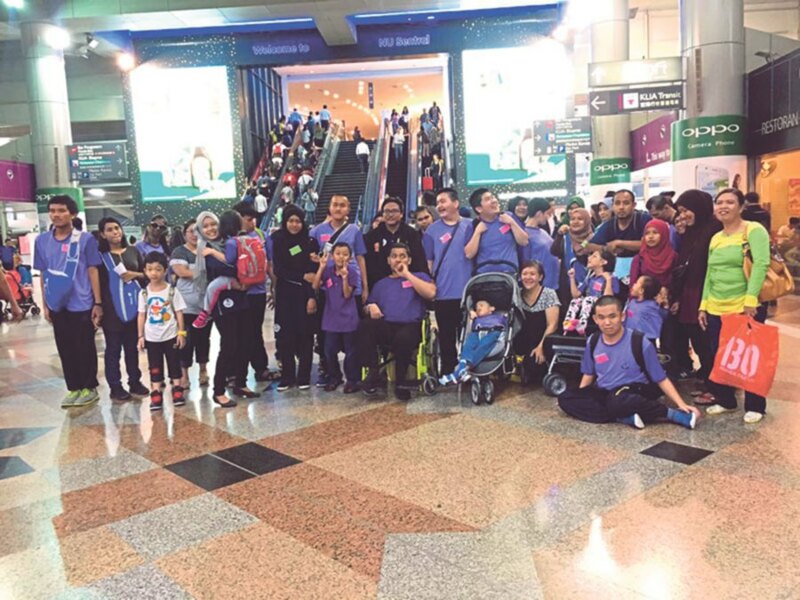 “We will also be doing more collaborations with non-governmental organisations (NGOs) and the corporate sector to get students involved in programmes to immerse the special needs community in society,” said Norazah. Associate Professor Dr Manisah Mohd Ali, who specialises in inclusive education, said the faculty also emphasises awareness of inclusive education advocacy, i.e. changing people’s perspective on children with special needs. Sahabat Faqeh members practising signing in Arabic. “For three consecutive years, master’s students have organised the International Day for People with Disabilities celebration. We will be holding the fourth celebration on Dec 3 which will see the attendance of the relevant communities and experts giving their support and taking part in the activities. “For one semester, undergraduates are involved in activities at community-based rehabilitation centres under the Social Welfare Department. They organise events with relevant agencies to take the special needs persons at the centres out for a movie or spend a day at the zoo. “We have had positive response from our students and it has opened their eyes to the public perspective on special needs people. The activities highlight the importance of supportive teachers to special needs children,” she said. Senior lecturer Dr Norshidah Mohamad Salleh, a visual impairment specialist, who teaches the postgraduate consultation and collaboration course, works with NGOs and potential employers to expose special needs individuals to possible employment. “The students identify and train special needs persons with specific skills as required by specific employers. These special needs trainees get the experience of working while employers get exposed to workers with special needs,” she said. Norazah stressed that the faculty’s special education programme aims to produce educators who are far-sighted, who can source for facilities which can be utilised by those with special needs and get the community to accept students with special needs. At Universiti Sains Islam Malaysia’s (USIM) Faculty of Quranic and Sunnah Studies the focus on inclusivity in education centres on providing the space and opportunity for spiritual awareness. Norakyairee Mohd Raus, head of the Ibnu Ummi Maktum (UMMI) cluster at the faculty, said that people with non-typical levels of ability are often left out of religious education. UMMI focuses on research into the Quran and sunnah for special needs people. USIM kicked off its efforts in religious education for special needs people in 2006 when it embarked on research into Quran in Braille studies. “While once not even one university in Malaysia offered Quran in Braille studies, there are schools offering the service like Princess Elizabeth School in Johor Baru. “Visually-impaired students learn to recite the Quran from repetitive listening and memorisation. Only a few teachers could teach students to read the Quran in Braille but they were untrained. “This prompted us to create a module for the Quran in Braille learning method. In the course, students are taught to identify the Arabic Braille alphabet, and the reading and writing format for Quranic studies. USIM students trying their hand at writing Braille. The effort later expanded to religious education solutions for the hearing-impaired and those with learning disabilities through partnerships with organisations such the Foundation of Quranic Education for Special Needs Children (also known as Yayasan Faqeh). In 2012, students at the faculty did practical work with special needs children at Yayasan Faqeh. The exposure and collaboration resulted in the establishment of USIM’s Friends of Faqeh group, better known as Sahabat Faqeh, a volunteer group which organises outreach programmes for those with different abilities. With the knowledge they gained through programmes at the faculty, Sahabat Faqeh members organised periodic activities such as Kem Huffaz Pekak Remaja, Jom Dhuha and Dakwah Tanpa Suara. 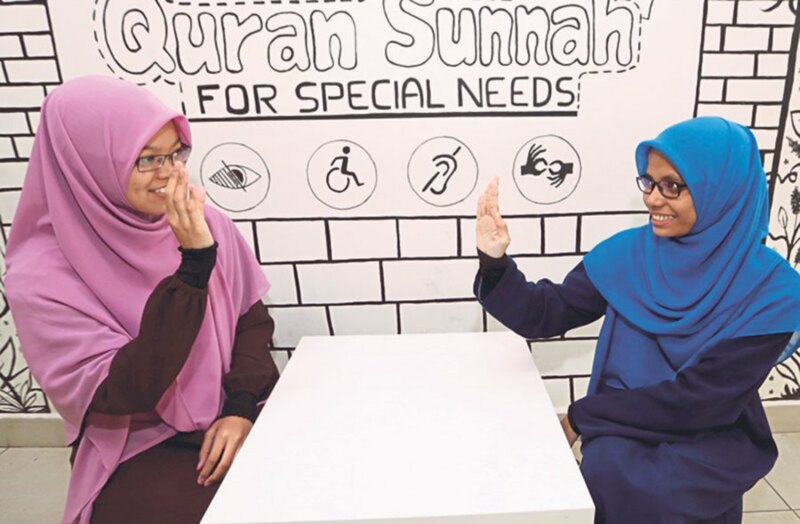 Nur Awatif Izzati Mohd Talib, a third-year Bachelor in Quranic and Sunnah Studies student who is Sahabat Faqeh deputy chairman, said the group aims to train undergraduates to approach those with special needs when carrying out religious outreach programmes. “You can’t just simply approach them — there are specific ways to do it. The activities we carry out also create awareness among the public that those with special needs too can be included in religious studies and programmes. “From my experience in working with those with special needs, I learnt that volunteer work comes from the heart. We can learn so much from those with special needs,” she said. Sahabat Faqeh chairman Muhammad Zainul Abidin Mohamed Tahir, a third-year Bachelor of Sunnah and Information Management programme student, said that the group will be embarking on more programmes for those with different abilities. “They include hiking with people with different abilities where we will attempt to infuse religious aspects into the activity. Religion can be learnt away from the confines of a classroom or mosque,” he added. USIM will be organising a convention on dakwah to reach out to special needs people in September. Students from all universities in the country are welcome to participate. This entry was posted on Thursday, May 31st, 2018 at 9:02 am	and is filed under Inclusive Education. You can follow any responses to this entry through the RSS 2.0 feed. Both comments and pings are currently closed.